Well close to finishing at least!!! Some of the ladies have finished and I have been plugging away on mine and it is time to share our progress. This fun Round Robin started in November last year when we created our center block and sent it off on it's journey. Each month a group member added an addition according to our organizer, Bea's plan, as this was a planned Round Robin where we each agreed to follow the rules of the month. Below is the block that I sent off 6 months ago to the group of Round Robin ladies. I used the little bear pattern from Tartankiwi which can be bought from her payhip site at the link. 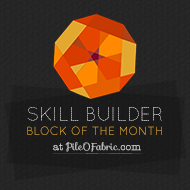 The first month we were to add three inch blocks all around the center block that was sent to us. Bea's block was the first one I worked on and part of the rules were we could only share a snippet if we were to blog about it...Can you believe the only pictures I seemed to have taken were of the snippet I shared that month? I don't have pictures of my completed round but luckily you can see her finished quilt on her blog at Beaquilter. She started off with a center block of a flag and sent a note saying it would be donated to a veteran. I loved this chance to honor a veteran so I added 5 stars and the saying 'Liberty For All' around her block. And sent it off for it's next addition. The following month, December, found me adding six inch blocks the top and bottom of Carol's quilt top. I decided to echo her center star block with a few additional star blocks around it in similar colors. One of the things I loved was Carol had sent a note explaining she did not want anyone purchasing fabrics for her quilt but to add something from our current stash. It was fun choosing just the right combo of colors to complement what she had started. I loved the border Bea had added and it allowed me to add a pop of blue in there. 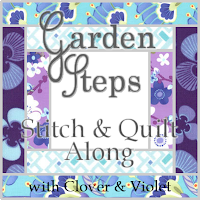 To make all those tiny stars happen in such a small space I just took some patterns that are available for free at the Quilter's Cache and drew them up so I could paper piece them. Those stars inside stars got pretty small and paper piecing allowed me to get the accuracy I needed. The patterns I used were all from a group called Valley of the Sun Stars. In January, I had the most fun adding six inch blocks to the sides of Mary's quilt featuring her bug house in the middle. She sent a little booklet explaining her Bug Hut theme and included a little picture of a house that she admired and had drawn inspiration from for her center block. So I sat down with some graph paper and drew up a similar house I could put on the sides to give more lodging for her bug friends. I couldn't resist putting a bird in one of the hut's windows as I knew he would be tempted to move in with all those tasty treats living so close by. The block had been sent to me from Julianne and she had included this wonderful low volume bee print for one of us to use if we would like. Heck yeah!!! Not only did I use it up but it inspired me to make the four bee blocks in the corners that I used it in. 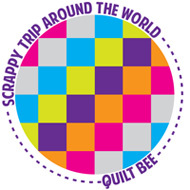 The bee pattern can be found as a free pattern from Beth of Piece By Number here. Thank you so much Julianne as I'm sure without your fabric contribution I would not have been inspired to include them and they turned out so delightful! February had me in turn working on Julianne's quilt top. This month our contribution was not as demanding, with us only adding a row of three inch blocks to the top and bottom of the quilt top. While a quick little addition is sometimes an easy no brainer I wanted it to have a dramatic impact on the quilt none-the-less. Not as easy as it would appear and it took me a while to find just the right block to contribute. Julianne's quilt was very scrappy, which I know she loves, and made it easy to pull from my stash but I just needed the right pattern. I found this diamond pattern that was part of a pattern called feathered star in the Spring 2001 Foundation Piecer journal and it just seemed perfect as it echoed the shape of Mary's stars and even Julianne's center block in my mind. I know it looks like I added them to the sides instead of the top and bottom but a quick 90 rotation takes care of that. Lastly, that left Allison's quilt top to work on in March. Wow, this time we were to add 26 six inch blocks all the way around the quilt top. When I opened the package containing Allison's quilt, I was simply blown away by how cute it was. Allison also sent a little booklet explaining the story behind her quilt top. She is turning 60 this year and having been born between Christmas and New Year's she felt she had kind of always been short changed at her birthday and wanted this quilt to commemorate this milestone in her birthday since this one was going to be a big one. She even gave us permission to go wild, be crazy and think fireworks, champagne glasses, and even suggested using LX for the roman numerals 60. Loving the opportunity to go big and wild, my brain went into overdrive. Mary once again sent inspiration by including patterns for cake slices, ice cream cones and party hats!!! Wow...I was on an emotional overload wanting to include them all as they all appealed to my paper piecing loving self to the max! 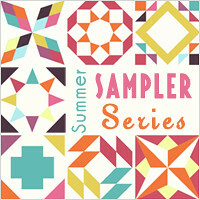 I found a different pattern for ice cream cones that I really fell for from Annie's Musings. You can find the pattern at the link. It lent itself well to the six inch block if I made the cone part one of the six inch blocks and the ice cream another six inch block. I put three of them on each side and that left the top and bottom open for more block ideas. Well champagne glasses didn't seem right with all that ice cream so I decided if this was to commemorate her 60th Birthday I should just put Happy 60th on it. So I paper pieced it out and had it up on the design wall for a while before deciding it ruined the "Oh how cute" feeling that I first felt when I opened that package and saw her quilt top for the first time. I loved that "Oh how cute" I had felt on first glimpse and needed that to be the overwhelming response when looking at this quilt again. It was back to the drawing board to see what direction to take next. I decided with her center cake and all that ice cream we just needed to slice it up and serve it to everyone! Since Mary had included the pattern for the cake slices, I set to work on adding them to the top and bottom and even got to work those fireworks into the corner to help her celebrate her birthday with the bang she deserves. The pattern I used for the fireworks was actually a pattern called Wyoming Whirligig that I located in a book called Paper Piecing Potpourri from Quiltmaker and Quilter's Newsletter. Allison, I had a blast adding my border around your quilt top and wish you all the best as you celebrate your birthday this year!!! I hope your 60th birthday is nothing short of spectacular!!! Now that brings us to April and me receiving my top back. WOW...I was blown away by the pure awesomeness when I opened my package! I sent him out with quite a few coordinating prints as I wanted the top to have a cohesive look that is not always found on Round Robin additions. It paid off and I LOVE, LOVE how my top looked when it came back home to me. Mary added some bear paws right off the bat, which I certainly secretly hoped would be included in the quilt. Bea then added some wonderful embroidery blocks and they were just gorgeous!!! She added an outstanding bear and another block that said, 'Beary Special'. Well, I couldn't say it better this quilt top is certainly a 'Beary Special' one and she included some more bear paws and sent some more coordinating fabric off with him. Thanks so much! Allison then added some chasing geese blocks on her round and hoped they could pass the muster. Wow...she is a silly goose because they were a WONDERFUL addition to the quilt and I love them. They are perfect and amazing surrounding him. Carol added just the perfect mix and blend in her scrappy addition and Julianne's border of pinwheel blocks are the perfect frame around him and I love all the additional fabrics she used while still having my original fabrics to use and give the quilt it's overall unity. Uh-Mazing job ladies!!! Thank you to each of you for all the love you contributed to Little Bear. Now it was time for my final border around it and I thought I would just add orange bear paw units in two opposite corners on each side having about 6 or 7 of them meeting in the two corners...but I just didn't like how it looked. I thought it would be a good frame but it was just too shocking. So I just kept adding bear paws and making them all the different colors reflected in the quilt. I kept all the paw pieces one color hoping they would stand out and frame him. They do indeed perfectly. I arranged them all which ways but loose but finally decided on having the right half face in and the left half facing in, in the opposite direction. It takes 64 of these and am only a little way over half way now. I have two sides sewn on and look forward to it's completion but I find making any block repeatedly tedious...so it will take me a little while longer. Then I think I will add another row to the top and bottom so I will have a nice lap quilt to cuddle under this winter in front of the fire. Would it be awful of me to add a couple arrows to the top and bottom. I certainly mean no harm to him but having done daycare for 12 years while my kids were growing up, I loved the story Going on a Bear Hunt...I'm not scared. We loved echoing the words and running back in reverse of the story to get back home just to say again...I'm not scared! Good memories and this quilt will be my good memories quilt of all those enjoyable years raising my children and so many others! What more can I say? I just adore him to pieces! He is adorable as he appears to be dancing across the ice playing in the glow of the Northern Lights!!!! What fun!! I enjoyed working on your piece and am delighted to see how it turned out!! I know you'll share pictures of it again when you get it to the size you want! And thanks so much for the great blocks you added to mine -- they really bring my quilt to life!! Of course the bear caught my eye right away! He is just awesome...but the additions were incredible. What a great round robin for all! Absolutely cool bear!!!! I think this is fabulous! Yay Yay Yay! Everyones turned out so AWESOME! I loved your bear so much, all those wonderful colors! 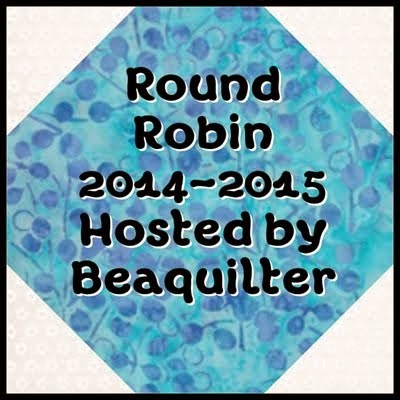 This planned round robin was so fun, I really enjoyed working on everyones quilts!